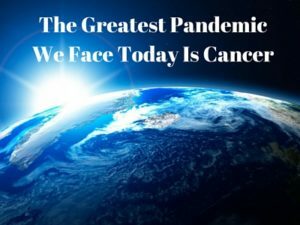 The greatest pandemic we face today is cancer and that’s why I continue to help educate people on how to stop making it. Dr. Coldwell asked; how do people in Asia react to your western approach? Here is my answer; well that’s a very good question. First, when they say traditional medicine what the people of Asia think of is traditional such as Thai medicine, traditional Chinese medicines, ayurvedic medicine. To them that’s traditional not we consider traditional which is the white coats, hospitals and such. So everywhere from Japan to India wherever I give lectures and open up my availability to them I let them know where I am in Asia. There they love it I get standing ovations. That’s much different because these people understand the power of botanical medicine. They understand the power of living within the laws of nature. Imagine if a woman has a lump in her breast or if a man has a nodule on his prostate and it never grows and it never spreads they’ll go onto live a normal life. The real question when they sit in front of us is not how do I get rid of this, it’s how do I stop making it. That’s the real question. That’s number one, the second part is that we target and eliminate the cancer without causing harm and we do that through metabolic therapy and they’re very effective. The third thing is to enhance the immune system because when the immune system is fully supported and operating effectively, it is devastating to cancer. If you do all three of those, you change your biochemistry so your body is no longer producing cancer, you target and eliminate what is there without harm and with the immune system functioning efficiently, you have an excellent chance of healing and recovering completely.